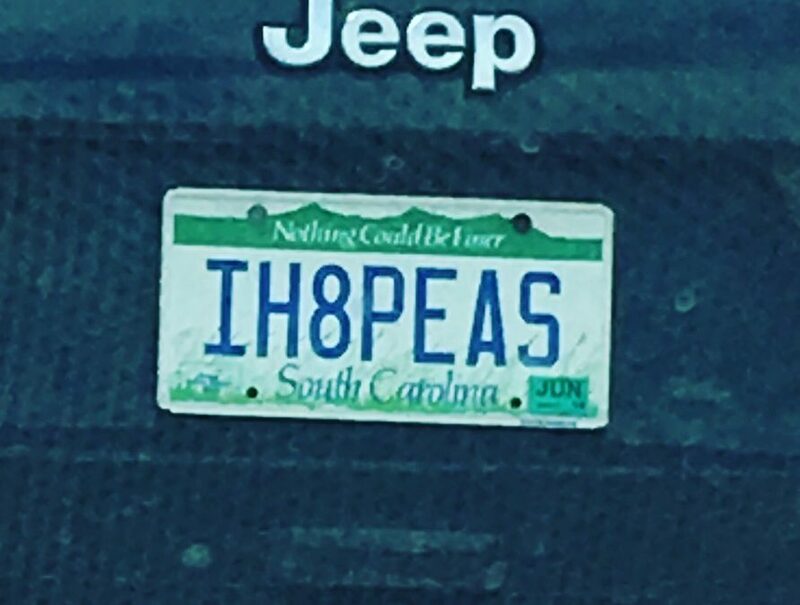 The license plate “IH8PEAS” succinctly states this Jeep owner’s point of view about peas clearly and humorously. 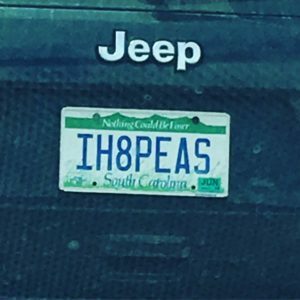 Yet, the Jeep owner’s health – including brain health — may suffer, not only from the lack of vitamins and nutrients from green peas, but also the expression of the negative sentiment. When you continually focus on the negative, even with license plates, passwords, and goals, you’re inclined to get mired in gloom and doom and delay. Back in college I had studied priming. Over the years since my graduation, neuroscientists and psychologists had learned more about priming’s effects on an individual’s mood and memory. As background, priming is when your exposure to something – an object, sound, smell or whatever – later affects your unconscious or unintentional response to something else. The first stimulus influences your thoughts, actions and choices after you experience a later stimulus. Once you make an association, your memory is primed, and you can recall it more readily — especially if the association is positive. Positive goals work better than negative goals because they’re easier to remember and focus on and more inspiring to do. If you think about it, negative goals tend to be about things you don’t want – distasteful vegetables, energy vampires, extra weight, dissatisfying work, and so forth. That makes them emotionally unappealing – maybe not to your prefrontal cortex, also called your brain’s executive function – but to your unconsciousness, which is where your emotions reside. It’s harder to whip up emotional energy to focus on things you don’t want. By flipping the negative to the positive, you’ll boost your focus and enhance your desire to work on making improvements. Now please note that I haven’t gone all mushy and sickening sweet for myself or you. Negativity, that is, negative thinking and feeling, is still useful, namely in these three areas. Paying attention to your gut. If you get a bad feeling in your gut, especially as you make a decision, your insula may be sending you an important message. The insula is a small region of the brain that contributes to our humanness. Thanks to the insula, we feel disgust, pride, lust, humiliation, guilt, and many other emotions. Sweating details. When you’re feeling threatened or are experiencing a bad mood for some other reason, your field of vision narrows. That becomes a great time to examine and analyze things in gory detail such as policies, procedures and plans. Inspecting already existing documents will be a more manageable and rewarding task for you than creating something new and innovative. Doing scenario planning. When you’re feeling anxious about something, consider channeling your apprehensions into doing worse-case scenario planning, which is helpful in a VUCA (volatile, uncertain, complex and ambiguous) world. You can contemplate various negative outcomes and possible ways to avoid them, which will help you and your team with planning and preparation. You might not face the disaster you had anticipated, yet when something bad happens, you’ll be better prepared to respond. All in all, living in an ecosystem that exudes light, sunshine, and hope is better than enduring one that radiates gloom, darkness, and fear. So, choose more positivity than negativity. Are you ready to switch on the lights and keep focusing on thoughts of love, positive language and inspiring actions?